Wow, it's hard to believe that we're into mid-November already! I guess you can tell that I'm still trying to hold on to every little bit of Summery vibes with all the bright holiday cards that you've seen here lately. But I promise to get into more traditional hues very soon! In fact, I have a batch almost ready for my next post. For now, though, I'm loving how much happiness these colors add to cold, dark winter days. 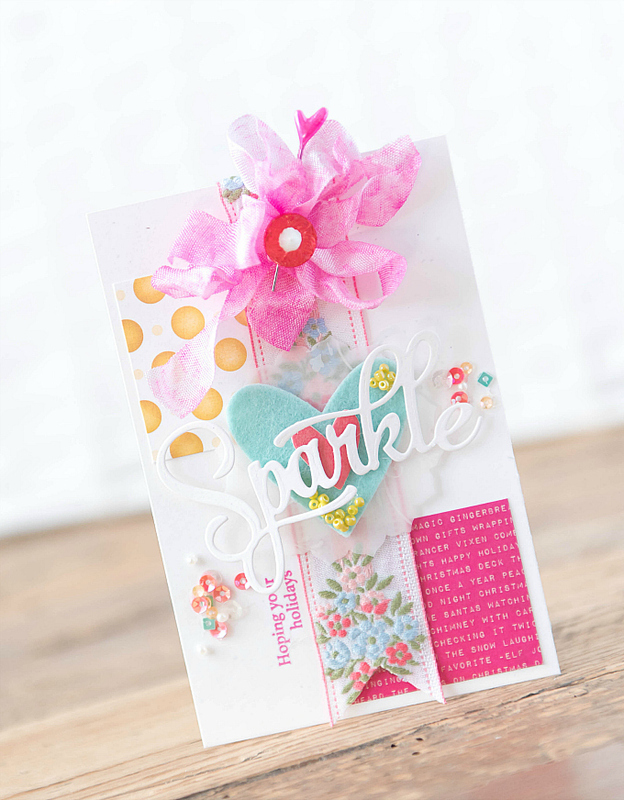 To create this colorful card, I started with a plain Rustic White cardstock from Papertrey Ink. I layered a couple of patterned paper bits on the top left corner and bottom right corner. 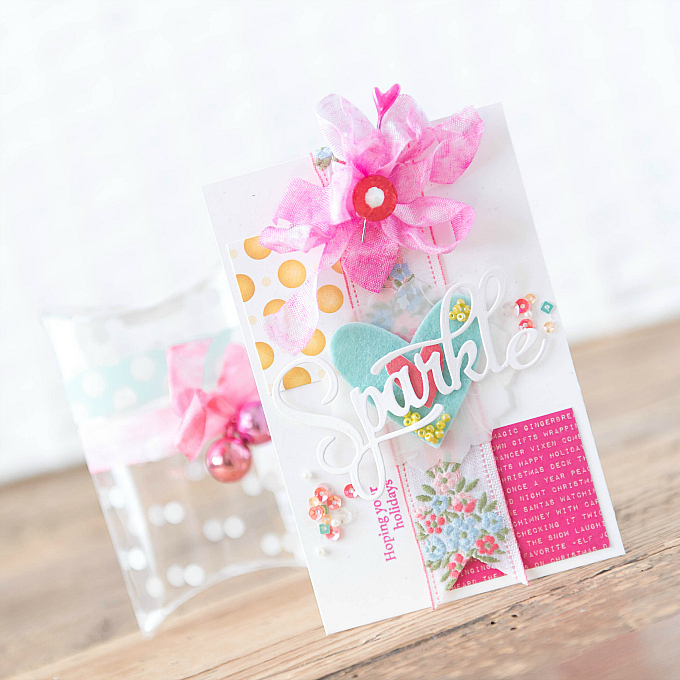 I love this beautiful patterned paper collection from Bo Bunny. It's a tad of an older collection, called Candy Cane Lane. It's super bright and festive and I love the bitty vintage touches! Next up, I added a vertical strip of embroidered ribbon - a purchase from MJ Trimming. The online selection doesn't quite match the awesomeness of the experience IRL...So even though you may not find things you are looking for online, if you are in the NYC area and love ribbons and novelties, do check it out! Just atop the ribbon, I added a scrunched bow, in a super duper fuchsia color with a matching heart pin and a sparkly center button. For the centerpiece, I cut a scalloped vellum round, using PTI's Limitless Layers dies, an Aqua Mist felt heart using the Heart Prints die, and a little paper heart using the Cover Plate: Hearts die. 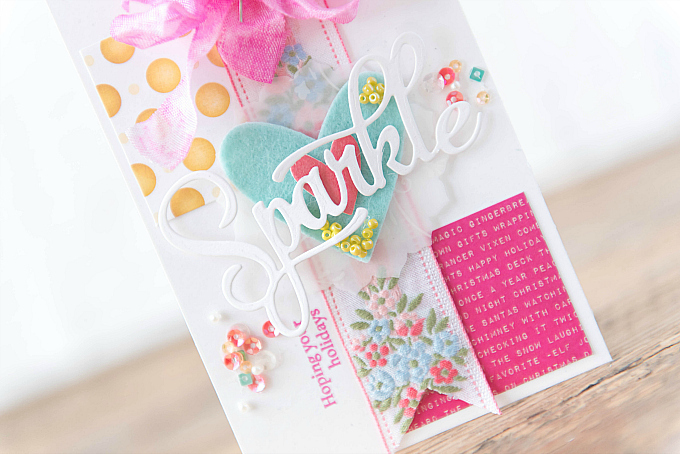 To top the centerpiece, I added a die-cut sentiment using PTI's Sparkle and Shine dies, and stamped a sentiment on the side using the Sparkle and Shine Holiday Additions stamp set, with Raspberry Fizz ink. I sprinkled a few bundles of beads and sequins to liven up the card, and to add a bit more festive color! The little bitty sequins are from Stampin Up, but I think this particular color mix is discontinued. They do have this really pretty mix, that's quite similar! I also made a matching pillow box, using some really pretty dotted clear cardstock, and PTI's Pillow Box die. I added a bit of ribbon and some miniature ornaments to decorate it a tad. 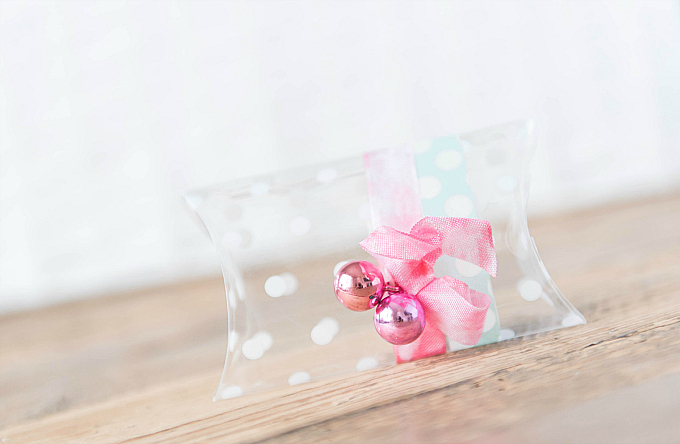 Such a fun way to package up a few Holiday treats, don't you think? Thanks for visiting, and catch you back here soon! What beautiful projects!! 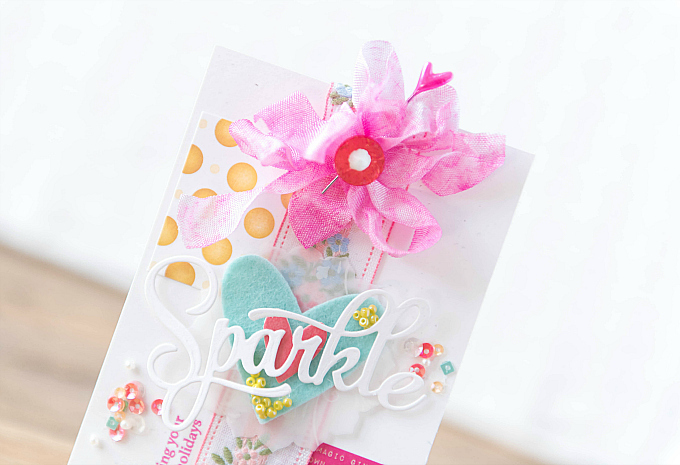 I LOVE your card with that fun bow and the felt heart. Totally stunning design! I always enjoy all of the pretty little trimmings you add to your projects! These are delightful. 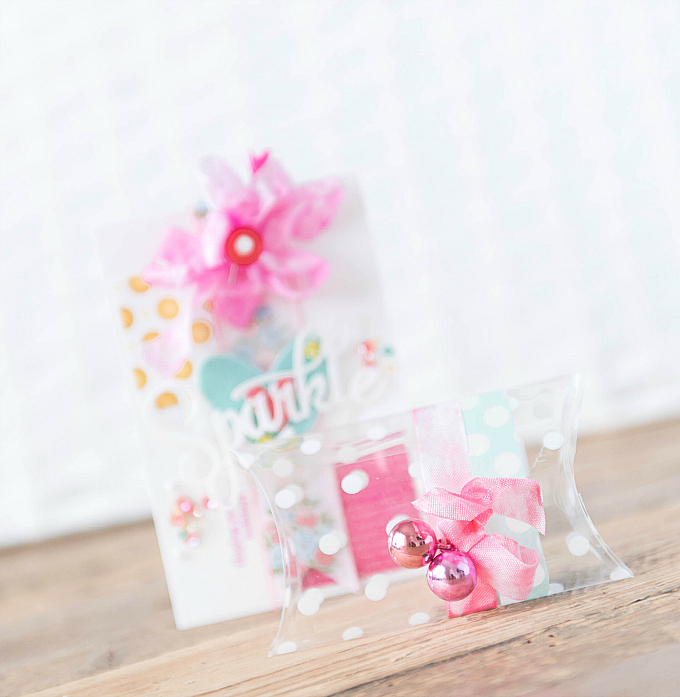 I'm smitten with the polka dot pillow box! Soo enchanting; so lovely Ivana! Thank you for sharing.